Get some color back into our sketchbooks (and these cold grey days) with some inspiration from the fabulous Frida Kahlo. Grab your favorite accessories (and/or a furry friend or houseplant!) and your oil pastels and create a colorful self-portrait. What are oil pastels? They are the happy medium between drawing and painting- works like a crayon, but the color intensity and creaminess of paint. 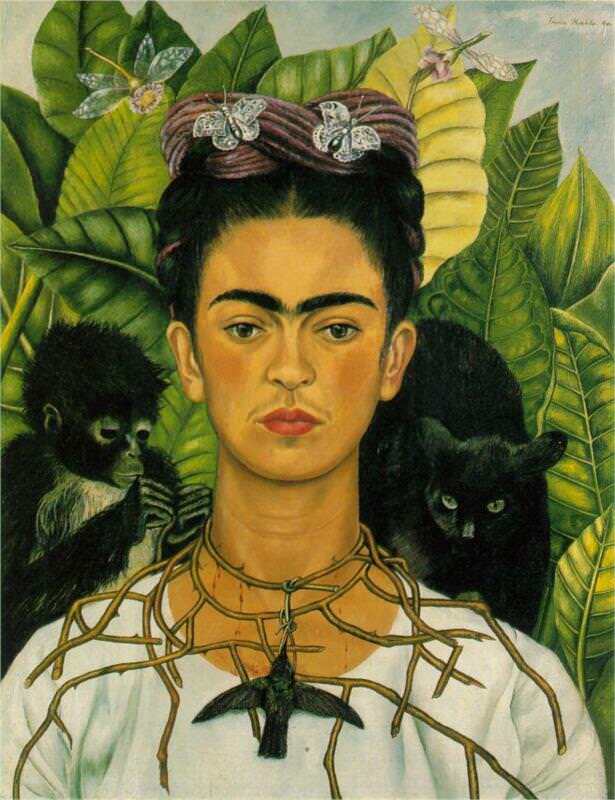 Feel free to exaggerate the color, your features, or the setting to enhance the “Frida-ness” of your self-portrait! All oil pastels are 15% off our everyday price! We have some great inexpensive sets from Craypas Expressionist or get real fancy with the giant Sennelier oil pastels (including the beautiful iridescent and metallic colors). Or get some fine lines for detail with the Holbien square oil pastels. Categories: Wet Paint Weekly Workouts | Tags: Cray pas, Frida Kahlo, oil pastels, self portraits, Sennelier, Wet Paint, Wet Paint Weekly Workouts | Permalink. Step up to the mirror, it’s time to do a self-portrait! Make faces or practice your cool-as-a-cucumber look, or try one of each using different materials. 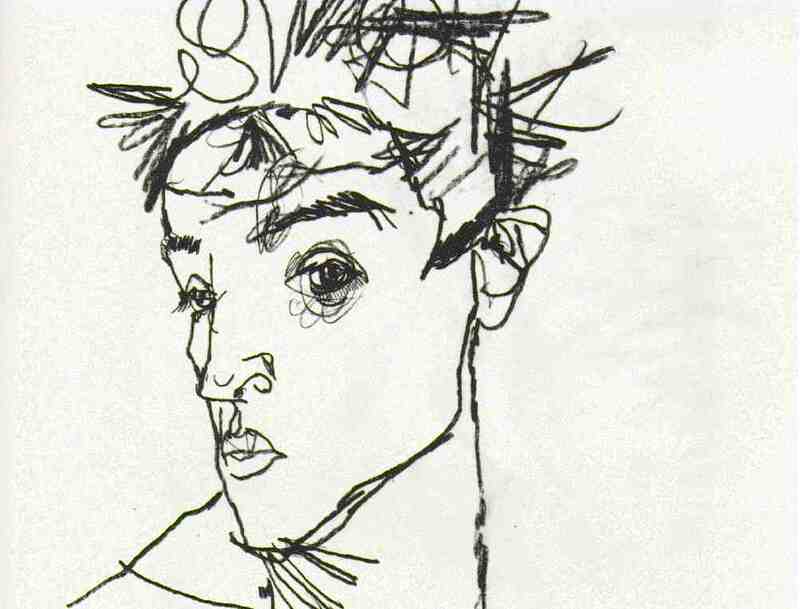 Self-portraits are great practice and these are meant to be quick and simple – just look at Egon Schiele’s example (nice work, Egon!). Try a contour line drawing (like Egon did) or simple brush strokes that frame your face, or smudge your way along with a graphite pencil. These don’t need to be perfect, just a reflection of your sweet self! Wet Paint will have several different drawing materials to choose from at a 15% discount for this week (2/26-3/4). Try the oh-so-popular Pentel Pocket Brush Pen (and it’s refillable! ), the smooth range of Palomino Blackwing Pencils, or the trusty classic Sharpie marker! Out of ink? You can buy new stuff here! And please feel free to share what materials you end up using. There are endless options out there to choose from! Categories: Wet Paint Weekly Workouts | Tags: art supplies, Palomino Blackwing, Pentel Pocket Brush Pen, self portraits, Sharpie, Weekly Workout, Wet Paint St. Paul, Wet Paint Weekly Workouts | Permalink.